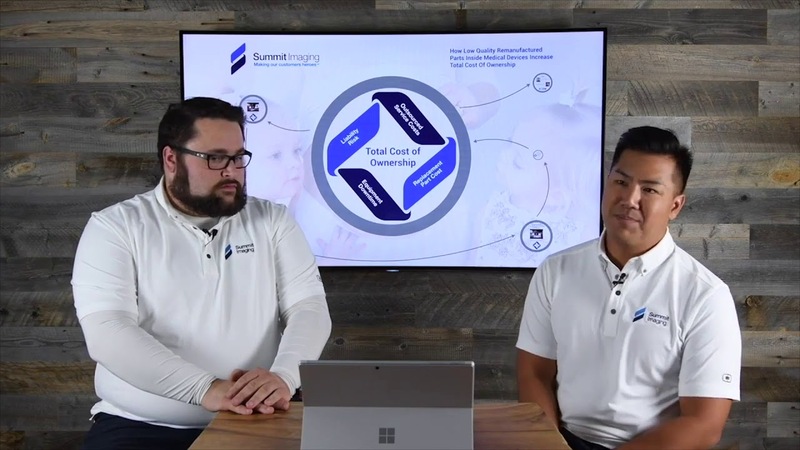 This 60-minute webinar will feature Larry Nguyen, CEO and CTO at Summit Imaging, and Kyle Grozelle, Manager of Global Education and Training at Summit Imaging. During this presentation, healthcare facilities will learn how to protect themselves from counterfeit ultrasound transducers that risk patient safety and lower quality of care. Ultrasound transducers are one of the most common imaging devices found in healthcare institutions, and their integrity is critical to providing excellent patient care. The healthcare industry is being deceived, as unvalidated ultrasound remanufactured components are being hidden inside transducers under the illusion of “repair”. These compromised transducers are exposing healthcare facilities to severe increases in total cost of ownership and unnecessary liabilities, all while hiding in OEM marked bodies. A thorough understanding of FDA regulations and requirements of remanufactured components will prepare healthcare facilities to select the best medical device support option for their organization. Webinar Wednesday would like to thank our sponsor Summit Imaging! Summit Imaging is an Ultrasound Parts and Transducer Repair company that can quickly address specific technical needs based on a foundation of outstanding rapid customer service. Their philosophy is simple; make their customers heroes. Visit www.mysummitimaging.com for more information.